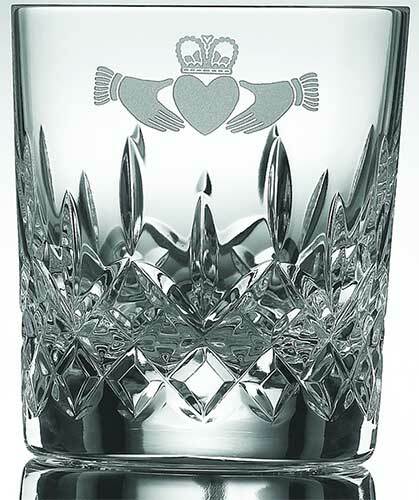 Irish whiskey glasses are cut from fine crystal that is enhanced with the Claddagh symbol. These Galway Crystal Claddagh whiskey glasses are sold by the pair. These Claddagh whiskey glasses are made of 24% leaded crystal. 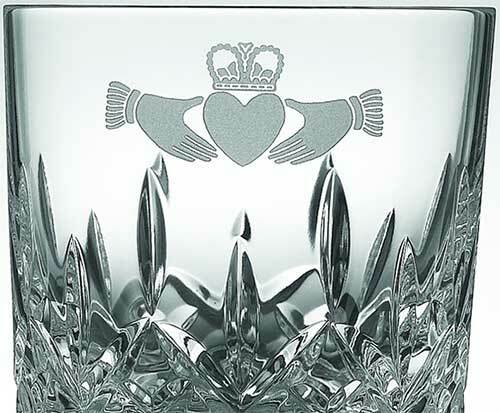 The crystal whiskey glasses feature an etched Claddagh icon along with a cut motif. The Irish whiskey glasses measure 3.7" tall x 2.2" wide at the base and 2.8" wide at the rim; these glasses are also known as rocks or double old fashion. Irish goblets are cut from fine crystal that is enhanced with the Claddagh symbol. Irish wine glasses are cut from fine crystal that is enhanced with the Claddagh symbol.